Keys Caribbean Retreat -CANAL HOME, FREE Ocean Kayak. 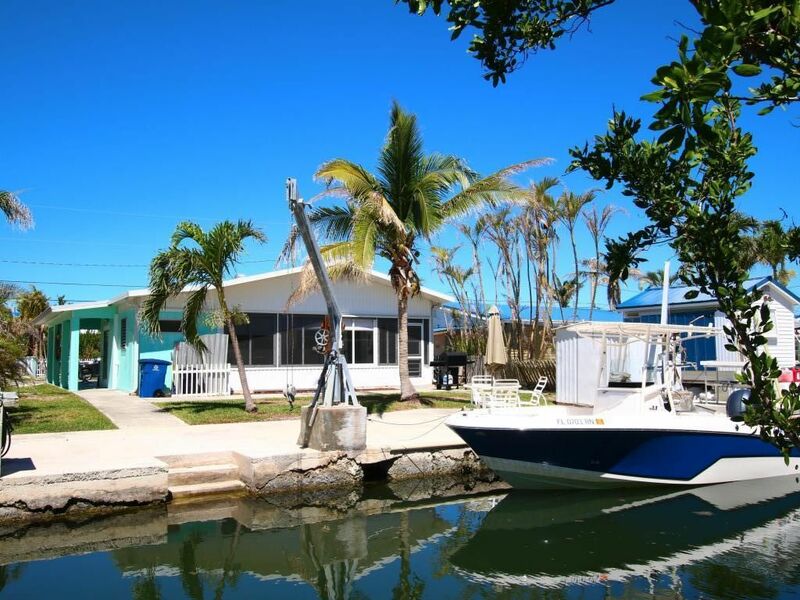 This 2 bedroom 2 bath ground level home with a glassed in Florida room, is on a boating canal with only 5 minutes at idle, 1/4 mile to open water. Canal has 50 feet of concrete seawall with bumper to protect boat hulls. The Canal is 30 feet wide and averages 8 feet deep. The kitchen is equipped with everything you need; dishes, (for outdoor as well as indoor) pots and pans, baking dishes, linens, toaster, blender, hand mixer, microwave, coffee maker, dishwasher, and very large pantry. The dining table seats 6. The master bedroom has a queen bed, the guest bedroom has twin beds. The second bath is located off the Florida room. The Florida room has reed blinds on the inner and outer windows for privacy at night. The home is very comfortable with an open concept and is tropically decorated. Outside is a sitting area dockside with a table, chairs, umbrella, gas BBQ (start up propane supplied), and fish cleaning station. Also a kayak. There are key deer that roam freely and visit the property several times a day. Makes for great pictures! Iguanas hang out on the dock occasionally and Great White Heron sit up on the davits and watch for fish in the canal. They also usually show up for an evening snack when you're cleaning fish. toilet, shower, Large walk in shower, vanity and toilet. 1/4 mile line of sight, to open water. Quick access to the chanel connecting the Atlantic and the Gulf of Mexico. Quiet neighborhood with undeveloped lots across the canal. Very private. 3 Miles from "downtown" Big Pine Key. Various shops, outlet store and Winn Dixie market. Home on a boating canal with 1/4 mile access to open water. On a boating canal with access to the Atlantic and the Gulf of Mexico. One quater mile ( 5 minutes at idle speed ) to open water. No bridges over canal. Bath towels, hand towels, face clothes. Love seat, two recliner chairs, flat panel TV, two end tables, coffee table. Fully equipped. Plenty of storage space and pantry. Large Bamboo, glass table with seating for six. Each bed room and the living room has it's own flat screen TV and receiver allowing enjoyment of separate shows. Com Cast TV and high speed internet. Screened Florida room overlooks lawn and sea wall / dock. Ocean Kayak available at no cost. Concrete patio / deck adjacent to sea wall. The approx.1100 square foot home is completely furnished. All linens and towels are supplied. central air conditioning. Ceiling fans in each room. Cable TV in Living room and bedrooms each with its own receiver. DVD player in living room. The kitchen has a refrigerator, dish washer, range with oven, blender, toaster, coffee maker, mixer, bake pans, dishes, pots and pans, dishes, microwave, utensils and flat ware. Living room has a love seat, cocktail and end tables, TV, 2 lamps and 2 reclining chairs. Dining area seats six. The home is tropically decorated The laundry room has a washer and dryer, is accessible under cover from outside and includes the bait freezer is. Big Pine Key affords great fishing, kayaking, boating and nature adventures. Big Pine Key is home to the Key dear, an endangered species, and they periodically come into the yard to graze. This area of Big Pine Key is quiet and relaxing. No traffic and noise. This rental includes use of a kayak, bicycles, and free high speed wireless internet access. Captain Ron Refuses to Participate in the Recession ! CONTACT OWNER. Monthly rates; $2850 for four (4)people. Weekly rates apply from May 01 through October 31. Schedule runs Saturday to Saturday. Add 12.5% tax to rates. Add $150 weekly cleaning fee. Add $150 monthly cleaning fee. The refundable reservation deposit is $300 and reserves your requested dates. I refund this deposit within 30 calendar days of your departure. Rates include; Utilities, Propane, Free broadband wireless, Kayak use, Cable TV, Free day pass to beach and Bicycle use. We accept Credit Cards from American Express, MasterCard Visa, and Discover. I also use PayPal invoicing. We're PCI certified for credit card information protection.